Mendeteksi kerusakan internal kabel fleksibel atau koneksi aksesoris lainnya terhadap regangan lenturan. 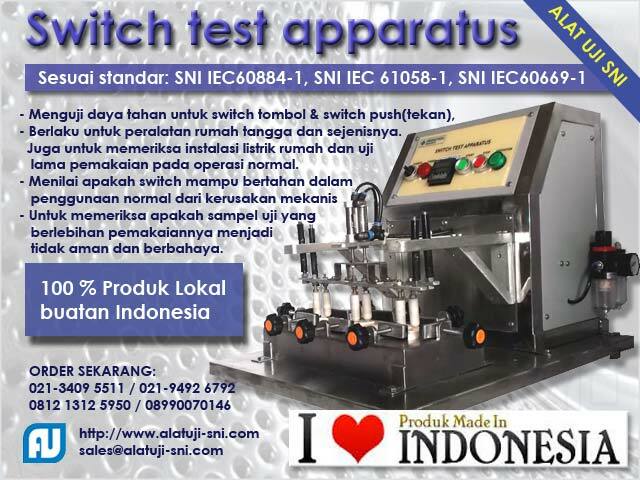 Plug Flexing Machine Tester can test three cables or cords fitted with plugs simultaneously. This improves testing capacity. IEC 60884-1 calls for 10,000 flexing at a rate of 60 flexing per minute. Halfway through the test, the cords need to be rotated 90°. The plug sockets are designed to make this rotation easy and accurate. The HT Tester has individual station counters so that any failure data can be retrieved by station. The cables are connected to a socket and the tail of the cable is connected to the tester to detect if an internal fault occurs with the cable wiring or accessory connection. The instrument starts in a vertical orientation and then flexes the specimens 45° on either side of the vertical for a total 90° of flexing. A standard rate of 60 flexing per minute is used but a slower rate can be selected if desired. A set of customer selected weights are included with the instrument so that the proper force can be applied to the cable during the test.